Why dont you share what you fix? i put the lines in spoiler, didnt show up. oh yeah, if you're interested i can also share a remove slot code to remove the last slot upgrade. So one can remove 4 slots with 4 items of this. it will check that the item has no slots and if it doesnt have any will fail the attempt, gets no exp for enchanting skill. those lines didnt work, remove them or dont add them. 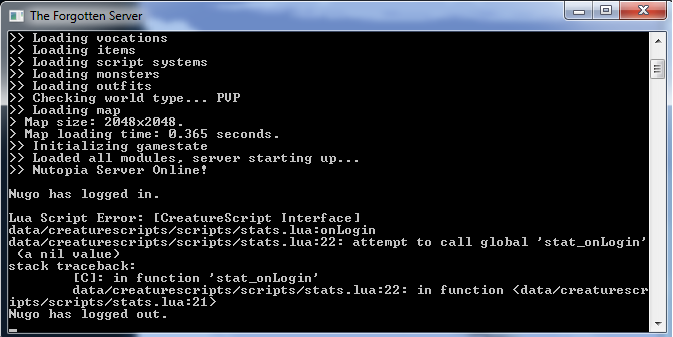 Did you reguster your stat.lua??? You are obviously missing either actions part at .xml or didnt declare it at global. Double or triple check, because this system is pretty old and it works just fine. because this system is pretty old and it works just fine. Many things were bugged and this spaghetti code isn't helping either. Guys just let me knkw which stats you want to keep and I will write a new one. @zbizu i had this system working since you released. It had some bugs applying some of the stats. It was easy fixeable, but it was extensive work since your code was so long, other than that code was good and great idea. Also, what he's asking its always been working. Is there any way I can make an NPC give an item with a determined upgrade? Not the slot, but the +x version of an item? Read the final part of the lib, there are some functions to do that kind of things. Hi all, I would like to ask for a help, I installed everything correctly in the OTX 3 Series ... And it did not work, whenever I try to use the 8300 stone on any item, it gives the following "cancel", "You can not use this object. " although everything is configured as I said in the post, can anyone help me? The bugs on this systems have nothing to do with the action part, which work fine. So, recheck! Only problem is that using a Rare, Epic or Legendary Gem on items such as Ring of healing, Life ring and many more items will freeze/crash the server. But i fear that there will always be one item im gonna miss out and someone will abuse that to crash the server. Has anyone found a solution? Gone through all 14 pages and only found a "fix" with 1 item aka Aol one. The easy fix is to forbid using upgrade on items without armor. That fixes most of the problems on this system. Also, ignoredIds part doesnt work fine. The system have plenty of bugs, you will find out the more you use it. Fixing them is not hard. Eventually all those 2000+ lines feel like nothing. i have only one problem.... u can solved it? Here is my fix to that: rare epic, legendary and random do not work on items with decay. WARNING: expoit; removing slot while an item has [atk+] or other, ( def, extra def,etc) it will get a boost on the stat each time the slots are removed and there is a slot thats not the last with [atk+] or other.